Bhangra Video - Gurdas Maan and his fabulous backup dancers! Rana Halprin is one of the few Gadje (non-Gypsy outsiders) that speaks Romanes from living amongst the Rom in the United States and Europe. In the mid-1970s she lived with the legendary Diego de Gastor family. She has devoted the better part of 30 years to documentation and dance within their communities. Rana grew up dancing with her mother, the famous Anna Halprin, and was instinctively comfortable with the Flamenco Puro form as an expression from deep within the soul. The following essay is an excerpt from her book in progress titled California to Campland: the Way of the Gypsies (Rom). The book will cover her long and enduring involvement with the Romani in California, Italy and Spain. Rana is also putting together film and still photography footage into a documentary on Romani refugees. This film covers the topic of dance and music as sustaining culture and survival, that being food for the soul. 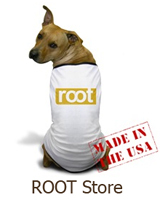 root is honored to welcome Rana Halprin as a contributor. For more information please visit her website at www.PhotoMythology.com . More than technique, it is personal style and attitude which makes music and dance distinctly Roma. For the Rom, the arts of music and dance are an expression of emotion, placing high value on improvisation, intensity, and originality. The Romani arts, including Flamenco, act as a system for teaching and claiming cultural history and serves as a collective healing. Romani music and dance is, at its peak, an expression of talent and sublimation. It is a manner of enduring and transcending life’s emotional repertoire of sorrow, grief and pain, as well as a celebration of life’s beauty, love, joy and vitality. The arts are a highly regarded force and discipline in many cultures. 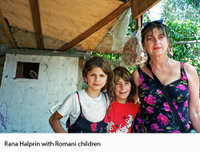 For many Romani, music and dance are “food for the soul”, a fully integrated and cherished aspect of life. Creative spirit permeates Romani life through music and dance, enhancing health and enduring spirit (often referred to as the enduring Roma). Their art transcends the worst of situations and often-extreme poverty and racism. Romani dance is an expression of the culture and how the process of art is integral to healing and personal freedom of expression of Romania (Romania being the ethos Romani culture). Flamenco, as a “Gypsy" art has been acknowledged and influential in Spain for years, giving the Gitanos a rightful (though far from equal) place. 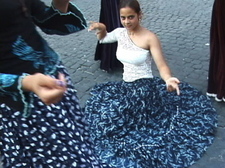 Flamenco thrives particularly around Seville, in Southern Spain. Dancers and musicians travel from all over the world to the Flamenco centers around Seville to study this complex, provocative and rhythmic style. Within Flamenco there is the Flamenco jondo (deep profound flamenco) and more upbeat Flamenco such as rumba and bulerias. In the Flamenco circles there are the “purists”, those that believe in the art of pure Flamenco, and the new generation of individuals exploring fusion. I believe both has it’s place. After all, life is constant change and an important part of creativity is to develop new expressions. Life is constant growth therefore, so is art. Just as Black Americans hold claim to soul music which originates from the Black American experience, the experience of Flamenco is a reflection of culture. It emerges from a deeply ingrained understanding of the compass (rhythms), duende (soul or transcendence) and gracia (attitude). Gracia is central to Flamenco Puro, it is a way of behaving, a point of view of life. In other words it is an expression of Romani culture. True Flamenco is also the ability to be spontaneous and create unique style or personal “signature” such as the Farrucos, the Amayas, the legendary families of Moron, Jerez, and Utrera De la Frontera. Flamenco Puro is the roots of flamenco from which numerous styles have borrowed and emerged. Flamenco dance, in all it’s forms, fusions and history is an enormous subject of many books which I do not aim to cover in this brief commentary, nor the purpose here. Flamenco Puro is first and foremost a cultural and personal expression and is built on a strong expertise, ease and spontaneity due to having grown up within the culture of the art. Romani music and dance steps can be copied, but, much to the chagrin of gadje (outsiders), Gypsy music and dance belong to the Rom. Esflamenco.com is one of the internet's best resources for all things Flamenco. To break down such an exhaustive subject is a monumental task and they do it very well. So how does one jump in? Start by reading through these articles on the basics of the artform. Listen to the music, find a local dance class and enter with an open mind, a lot of patience, and most importantly, a passion to keep at it. Flamenco is not easy and there will be many classes where, as one dancer put it, you will cry into your ruffled skirt. You are not going to be the only one frustrated on occasion, but the rewards of feeling the movement and the music have no comparison. You just have to start. Sevillanas is a joyful and lively couples dance performed at the Ferias in the South of Spain characterised by its gracefulness, liveliness, nimble dynamism and its flexibility. A type of Castilian folk dance, it is not truly a form of Flamenco, but one can consider it a close relative. 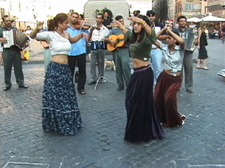 EsFlamenco.com writes that Sevillanas are a "traditional folk song proceeding from the seguidilla manchega (from La Mancha), which has taken on some features of flamenco. It was born to accompany the dance that is performed in pairs, in series of four sevillanas. It is the Andalusian dance that has become most popular and, at present, even people in nightclubs dance to it. Once it used to be danced in patios or houses used for neighbourhood gatherings, also known as corrales, and people have always danced to them in romerias and other Andalusian feasts, Increasingly more people know their steps, as a result of the proliferation of academies." More of the topic of Sevillanas can be read here at Flamenco World . La Feria Andalucia in Barcelona is where this picture was taken. 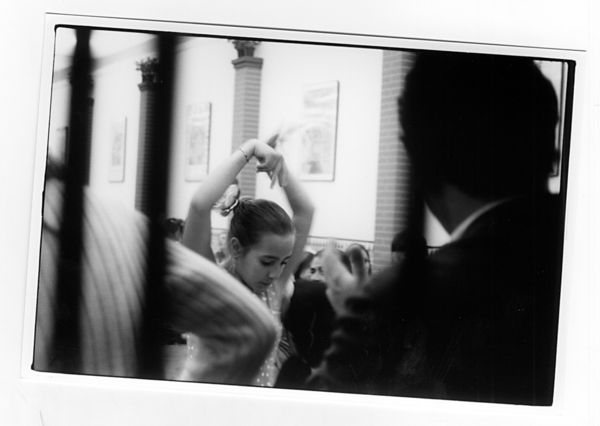 The following photo essay is from this event in 2003 where I first (naively) realized that Flamenco is not merely a dance performed between courses at your local Spanish-themed restaurant. La Feria Andaculia is one of many festivals that bring out entire families partying till dawn, dancing Sevillanas and seeing performances of famous dancers and musicians. Enormous vats of paella, amusement rides, endless cups of La Guita and tent after tent of Flamenco dancing. The most popular of these happens in Seville, Andalucia called La Feria de Abril. Flamenco is a culture and a deeply rooted passion. 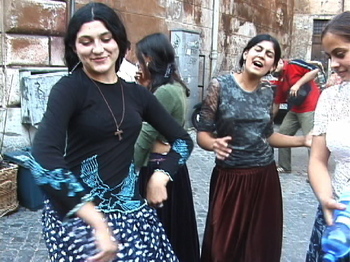 Its various songs and styles express the generations of the journey of the Roma. Jewish, Romani and Moorish influences can be witnessed in the Flamenco of Spain. root will be uncovering these origins and featuring articles and photos on teachers, dancers and the Roma. View the photo essay by the thumbnail at the left of the page, or click here. Maisa Duke and Energia do Samba dance at Club Rocapulco in San Francisco, California on April 6, 2006. Sambada & Jorge Alabe on drums play as Maisa gets lead vocalist and dancer Dandha Da Hora to join her in a solo. My first Samba in Brazil took my breath away, literally! It was 1989 and I arrived in Rio de Janeiro to the mounting agitation that accompanies the weeks before Carnaval, to me the best time of all! After a tedious travel itinerary (via San Francisco, Los Angeles, Miami, Peru, Sao Paulo and finally Rio, que vagabond! ), we (including a half dozen or so of my hosts’ relatives), landed at the home of Dona Glorinha, a dear friend’s mother who conveniently lived just blocks from Copacabana Beach, the heart of Rio de Janeiro. At the time, I was dancing with several Bay Area dance companies and dancing Samba in Brazil was no longer a dream. I had performed ballet professionally as a child in New York and as I reached my teens, found that ballet was leaving me virtually uninspired. I hadn’t yet found a style of dance in sync with my energy level, soul and desire! In college I minored in Afro-American studies. In actuality, the “minor”, a jazz dance company performed works by Alvin Ailey and sometimes wild, funky things set to the music of Parliament or the Ohio Players. When I relocated to San Francisco in the early ‘80’s, I stumbled into Benny Duarte’s Samba class at Third Wave dance studio. His class and personal tutelage brought my immersion into the Brazilian culture full force. Have you ever tried playing an agogo while dancing Samba? Bennie taught me. Try it sometime and you’ll get a good laugh at yourself. I did. Along with several friends, we began studying Portuguese in the hopes of traveling to Brazil. From 1990-93, I directed and produced a dance company in San Francisco, which often included Samba in its repertoire. It was the early 90’s, and Samba was hot! The B movie, “Lambada” had just come out, and everybody was talking about the dirty dancing of Brazil. It didn’t matter how you were doing it as long as you were feeling the Samba passionately and fervently. I was in heaven! The movement was sensual and fast! The steps were intricate and the energy from the Brazilians around you, gave one a feeling of Carnaval. For awhile I was married to a Brazilian, a Baiano (someone from Bahia.) He came with his own jeito (style) as most Baiano’s do and I developed mine. We lived out (and I continue to live) a type of Brazilian novella. It was crazy and wonderful at the same time. 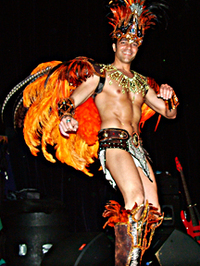 Samba is one of the world’s most familiar forms of music and dance. Its origins from African roots date back to the early 20th century in Rio de Janeiro (then the capital of Brazil.) 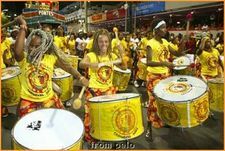 The word Samba is thought to come from the Angolan word semba (mesemba), a religious rhythm. The rhythm is duple (2/4 time, with three steps to every bar) and thought to be derived from the earlier slave batuques. Just saying the word aloud, Samba, evokes the senses and conjures up images of cascading color, undulating movement, sequined costumes, an illusion of tropical breezes and a taste of the forbidden. Almost anyone will say to you that someday they will visit Brasil. It is an experience to be witnessed at least once in one’s lifetime. Samba can be found everywhere; in each city, countryside, on a mountaintop, and of course, on a praia (beach.) It’s danced by young and old, thin and wide, rich and poor. The wild unabashed style is unique to each performer and if Brazilians can find a reason to shut down the city for a few days, Samba (during Carnaval) is one of them! This gringa can Samba. I find the syncopated rhythm intoxicating and often find myself floating into a sort of trance after several hours of Samba (and I’ve never had a better bunda too!) I have even taught Brazilians how to Samba, since not all Brazilians know how. At times I have been mistaken for a Brazilian (hopefully because of the way I Samba!) The other day, Bujao, a friend, smiled and corrected his Brazilian cousin, saying that no, I wasn’t really Brazilian but a “Brasileira de Corecao (Brazilian at heart.) I think by now I am also a soulful Brazilian. 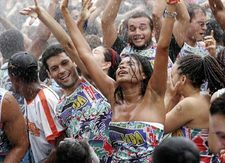 Samba, is a way of life, and its major artists and performers are revered in every Brazilian household, regardless of socio-economic distinction. 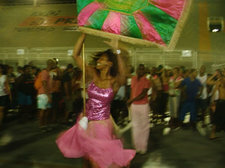 Perhaps, that is what is so enigmatic about Samba, it brings a diverse country whittled with political injustices and economic turmoil together, bonding the povo of the favelas, the Gaucho’s of the countryside and the rich and famous portrayed in the media advertisements in Globo and Manchete. A Samba rhythm can begin with a Surdi or Agogo. A soloist or group of Sambistas will burst into a circle of singers and musicians who will then surround them, clapping, singing or playaing several instruments, like the repinique, caixa, surdo, chocalho, panderio, agogo, tamborim, cuica, apito, timbal or cavaquinho. During Carnaval, Escolas de Samba (Samba Schools) can have as many as 500 drummers playing at a time. Imagine the loudest car bass system you've ever heard, times that by 500 and you've got the feeling. Your heart feels like it will pop out of your chest when the bateria de Escola de Samba passes by. 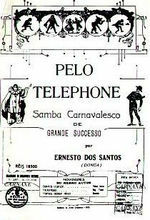 "Pelo Telefone" (1917), bu Donga and Mauro Almeida, is considered the first Samba recording and its success carried the new music putside the Favelas (hillside ghettos of Brazil). Brazil's old sound has begun to make a comeback in Rio, taking the place of American-style rock music, which has long dominated the Brazilian pop charts since the 1960s leftist musical movement of Bossa Nova. In the latter half of the 1960's, Samba took on a new significance as groups such as Os Mutanted (The Mutants), the revolutionary singer Tom Ze and Joao Gilberto began to blend it with experimental rock. I've found many people who have never heard of Samba do not have any idea as to what it could be. Many times I've been in a conversation only to realize after 5 minutes that the other person thinks we've been discussing Salsa. In Part I of 'What is Samba?' I'd like to direct you to Scotland of all places. Take a peek at SambaYaBamba , Glasgow's "Biggest and Loudest Samba Band"... and possibly Glasgow's only Samba band? “So sei de um sambinha antigo que tem uma das minhas linhas favoritas: quem ja passou por essa vida e nao viveu, pode ser mais sabe menos do que eu, porgue a vida so se da pra quem se deu, pra quem amou, pra quem chorou, pra quem sofreu” (who has just passed through this life, has not lived, could be more than I but no less than I, because life only gives to those who give, to those who love, to those who cry and to those who suffer”, from an old samba song. “When Carnaval came we always went out of the city to a Church camp. “The music is outgoing and a good spirit. I participated at the Carnaval parade in San Francisco. Because I’m a foreigner, I liked it and got a group of people together. I made my own group, gathered a group of friends and put everybody on the street. I arrived here in America and I was surprised to see the San Francisco Mission street parade and I said lets go! dancers and singers. They played music all the time. Dancing was a major part of my time growing up. That was my first exposure to the music and to me it meant a lot about sharing, connecting, enjoy the music. Most of the Sambas are happy, singing about the joy of living. That is what I remembered most about the lyrics! Paulinho da Viola is a great Samba singer and Bete Carvalho, she is the Queen of Samba!" “I have always been keen on sports such as judo, tennis and softball. Therefore, dancing and music could never follow. One time I had a girlfriend who loved dancing Samba. She was pretty and once was invited by a famous Escola de Samba of Sao Paulo for the parade during Carnaval. E agora, life in Brazil is kinetic, naturally that’s why I’m off again to Brazil, perhaps to discover something more about myself, or to inhale the spirit of Carnaval, or to just drink a damm good caipirinha on the beach. Really, for me, to be near the sea and earth… that will make my heart sing again (maybe a samba tune!) Ate logo! The directors of the samba school are distributing paper fans that contain your school’s song. Since you haven’t been rehearsing all year, and were on the gringo flight from New York the night before, you have one hour to learn. It’s important to make an effort so the judges won’t notice and deduct points. You are in Rio de Janeiro, Carnaval Capital, and the crime rate has dropped this week because even the thieves are dancing. You’ve escaped the snow and cold of your own country, and are being taught by two Brazilians how to gate-crash in the tropics. One has an “in” with the doorman of three ex-boyfriends ago. Arnaldo, the doorman, makes a few calls, and takes you to meet Maria, a big-shot samba director, who looks at you and the German tourist you are hanging with and shakes her head. Later, you will realize she has already typecast you both as “non-dancers” and wants you at the end of her parade. She writes an address on a scrap of paper, and sends you to the house of a seamstress who gives you both sparkly Bermudas and a brightly-colored shirt. Actually, you are relieved. You were afraid it was going to be a tiny bikini bottom and nothing else. Your costume is almost chaste. If this were a Christmas pageant; you have been assigned the role of a Shepherd. Now, it is Saturday night and your school is waiting backstage at the entrance of the Sambodromo. Chocolate. Your school’s theme this year is chocolate. When you look around, everyone looks chocolate, either tanned by three months’ of summer sun or painted by nature, as they say. Your group shimmers with sequins, two hundred people with the same costume; you are all ice cream vendors complete with Styrofoam coolers strapped over one shoulder. This proves to be too authentic for the locals, who cut through your crowd of dancers as if this were a public street, and ask if you have beer or water to sell since it’s so HOT. A school organizer stoops in front of you and covers the blue stripes on your tennis shoes with white tape and great authority. You didn’t get the memo about the all-white shoes. The float ahead contains numerous feather-covered dancers: statuesque women with peacock-like headdresses and thigh-high white boots. Perched on the wobbly platforms, they stand with their wings closed, and await the performance. The men who steer the floats crawl underneath its stage. No motors are allowed. Just strong dark arms that direct the float like an old vessel. You try to clear your head, but have a fast and panicked thought about the fate of the rental car that you left near the stadium. Did you check that box for insurance? You paid a boy five dollars to watch the car, and know that he could make a hundred if he took your tires or even the radio. Maybe by now, the car was already on its way to Paraguay? The crowd lurches forward and you stop worrying. The other members of your parade are filing into place, the Bahianas with their impossibly large colonial skirts, the musicians beating on small tambourine-sized drums, and other dancers with impossibly heavy, head pieces that they touch gingerly with one hand to steady. The colors are orange, white, blue, and violet. Bodies are covered in more paint than costumes with bare skin everywhere. The crowd moves and turns together, arms and torsos bump into you, and glide away. Arms pressing on your shoulders indicate that someone is trying to squeeze past you. The real vendors join the parade, finally! They sell salvation in the form of beer and water. Beer is spilled with the movement of the crowd, trickles down your legs, and sloshes into your shoes. “When do we begin?” the crowd asks. Your group is rehearsing the song. “Just learn the chorus,” a woman says who hears you struggling. Some voices complain loudly that their costumes are hurting them. “Help me,” a blond Indian princess begs. Her eyes are full of tears and she points to the red welt on her shoulders where the metal frame is digging into flesh. You tear off a strip of fabric from the fringe on her dress and wrap the shoulder frame for her. Carnaval is like an overzealous lover. Once it starts on Saturday night it doesn’t stop, day and night until Wednesday. It pulls you against its warm chest and makes your heart beat with the same rhythm of the drums. It tumbles with you in humid sheets, and reaches after you if you try to sneak away. No matter how much you feign exhaustion, Carnaval goes on all around you. Since last February, when they announced the winners, the schools have been preparing for tonight. The favela leaders organize their residents and artists collaborate to create new songs and themes each year. Some of the production money comes from the participants themselves and gringos like you who come parachuting in at the last moment. The drug lords fund the gap. A fleet of sewing machines races over waves of new fabric to create the new fantasias: costumes. This is serious competition, complete with spies from other schools who want to infiltrate. School members are expected to show complete loyalty, because of the reward: an hour and twenty minutes under the hot lights, in front of the crowds in the over packed stadium and the television cameras who broadcast images for the entire samba-loving world to see. The rich stadium spectators tell the mostly poor performers, the same people they resent during all the other days of the year, “You are beautiful.” For tonight, you are before a society of equals. This is the real fantasy of Carnaval. You are still waiting with your school to enter the stadium. It is more crowded now; everyone is ready, wired with nervous energy, and listening for the final instructions. Your German friend practices a dance move. Maybe Maria was right about your place at the end of the parade? “Hats all forward,” yells one of the school directors and your group adjusts the bills of the costume hats. “Here we go,” someone in the crowd shouts. You are nearly crushed in a human pile-up with everyone pushing forward. The float directly ahead of you begins to move and turns a wide and arching left; so wide that a feathered bird woman, perched on one of the platforms, is now careening towards a tree. People shout for her to grab a branch. Her large headdress makes her movements slow and awkward. Everyone starts screaming, the float makes a dull thud against the tree trunk, and she starts to fall with her arms outstretched like a white swan. Her arms catch a branch and she struggles to keep her grip. The float continues without her, because your school has officially entered the stadium and the clock is running. The woman’s perch is empty and her frantic movements cause leaves and broken branches to shower the people below her. “Get out of the way!” A flat-bed lift pulls up under the tree and in an instant has risen to her height, but the man can’t quite reach her. “Let go,” he asks. She does and falls five feet into his arms. The crowd gasps with relief. Her white-ribbon tail feathers are still snagged in the tree. The man cradles the woman, tugs twice on the ribbons, and then rips them from the tree until they snap. They race after the rolling float, and the man is able to return the woman to her platform just in time. At that moment, the crowd in the stadium sees the float making its grand entrance and a deafening cheer erupts. The white-swan woman raises one hand in the air, like a gymnast, and arches her back. She is all smiles and the sequins on her costume shine brilliantly under the stadium lights. Your song begins and you dance and sing, as if you’ve been doing this all your life. You are under the lights of the stadium on a blinding world stage, and you jump, and are pushed, and shake your hips and sing. And for a few moments you are in synch with a larger rhythm, as your heart beats and your blood pumps with the motion of the world spinning around the sun. Even the angels in the heavens seem to pound on your temples, with their chubby fists, and join you in your laughter. There is the sound of rapid-fire explosions in the air; a sound your ears struggle to recognize. It’s a burst of automatic gunfire from the slum hill at the rear of the stadium that is filled with white lights that compete with the stars of the night sky.